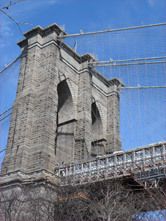 We'll pick up our guide in Manhattan at 10:30am and head over to the DUMBO section of Brooklyn to our first stop, the Brooklyn Bridge Park, a beautiful, 9 acre park with the most stunning view of the Brooklyn Bridge. Our guide will review the area's history and show us famous landmarks and points of interest. We'll then board the bus and drive through the neighborhood showing scenes from "Scent of a Woman" and "Once Upon a Time in America" on the bus's television monitor as we drive past those movie locations. 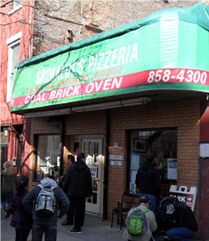 From there we'll make our way over to our next stop, Fulton Ferry Landing at the foot of the Brooklyn Bridge where we'll walk around looking at landmarks in the area before going to Grimaldi's to enjoy their famous authentic Neapolitan pizza. Each person will receive 2 slices and a soda. We'll then board the bus and make our way onto the BQE and past neighborhoods such as Red Hook and Sunset Park all the while pointing out famous locations and landmarks. We'll visit Bay Ridge and drive along scenic Shore Road along the waterfront past the million dollar mansions located in the area as well as a stop at the famous "Gingerbread House". As we drive past the Verrazano Bridge towards Bath Beach and Bensonhurst we'll show scenes from Goodfellas, Saturday Night Fever and Annie Hall as we pass those famous movie locations. 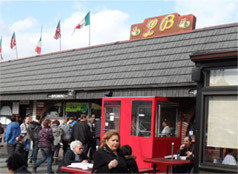 We'll then make our way over to L&B Spumoni Gardens for the best authentic Sicilian pizza in Brooklyn. We'll each get 2 slices and a soda here as well. From there we'll board the bus again and make our way over to the Coney Island section of Brooklyn. 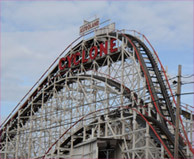 Once there, we'll get off the bus and make our way onto the famous boardwalk as we walk along and point out famous landmarks such as the Parachute Jump Ride, the Wonder Wheel and the famous Cyclone roller coaster while going over the area's rich history. 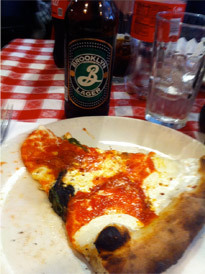 We'll get back on the bus and start the journey home, passing through through the Brighton Beach section of Brooklyn. Our guide will take us over to the BQE entrance of the Verrazano Bridge and bid our group "Ciao!" as we start to make our way home. During that time, we'll show a 15 minute presentation on the TV monitors set to music featuring famous Brooklynites from television, movies, sports, etc. Call or email us to make your reservations today. Don't miss out on the most entertaining trip you and your gal pals will ever take to NYC!